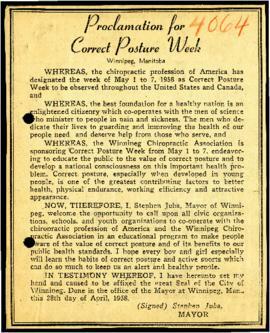 Subseries consists of proclamations issued by the office of Mayor Stephen Juba and related documentation, including correspondence and newspaper clippings (1958-1971). Not all of the proclamations are final or official copies, as many are unsigned and some only exist in draft form. Gordon Tucker created the design for proclamations released at this time. The Mayor's Office issued proclamations to mark special events as well as to recognize and honour individuals, groups, organizations, industries, and achievements. Although the practice is ongoing, the issuing of proclamations no longer occurs on a regular basis. Arranged into chronological order by Archivist. Original order was loosely chronological.